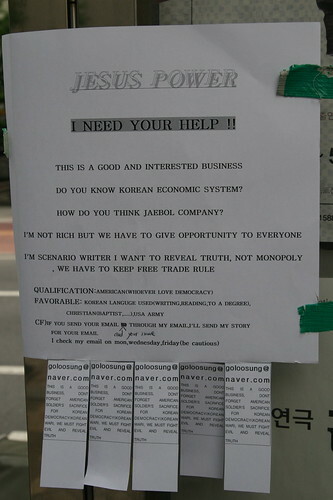 Walking round the streets of Yongsan today I found this wonderfully inspiring job offer. I thought I'd bring it to your attention, just in case you might want to join up. DO YOU KNOW KOREAN ECONOMIC SYSTEM? 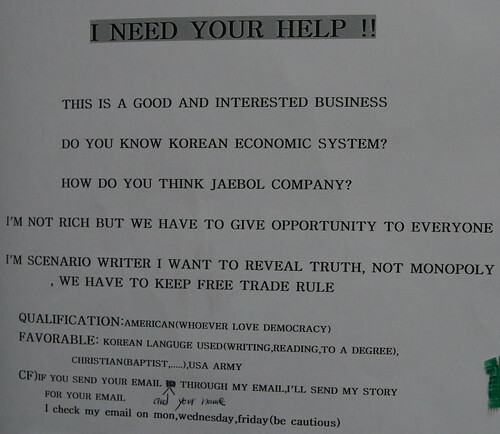 HOW DO YOU THINK JAEBOL COMPANY? Unfortunately, I'm not American and so do not qualify for any position available (Though I would like to point out that I do love democracy). But I hope that those of you who hail from the United States of America have a chance to experience Jesus Power.